Scary Flawed Little Mustang, Poor Guy! This is not a sales page, just informational and fun to look at. Custom Glaze Hagen Renakers, or any painted china, is not for the faint of heart. Far more can go wrong than right. The poor mustang is an example of what can go wrong. Yikes! With that said, I will be offering the ones that turn out for sale from time to time. This is more of a side hobby that I enjoy, and a way to offer something a little different, but they are a long process, multi firings, and when they turn out like the Mustang...well, they are pretty discouraging. But they are mighty cute when they turn out. 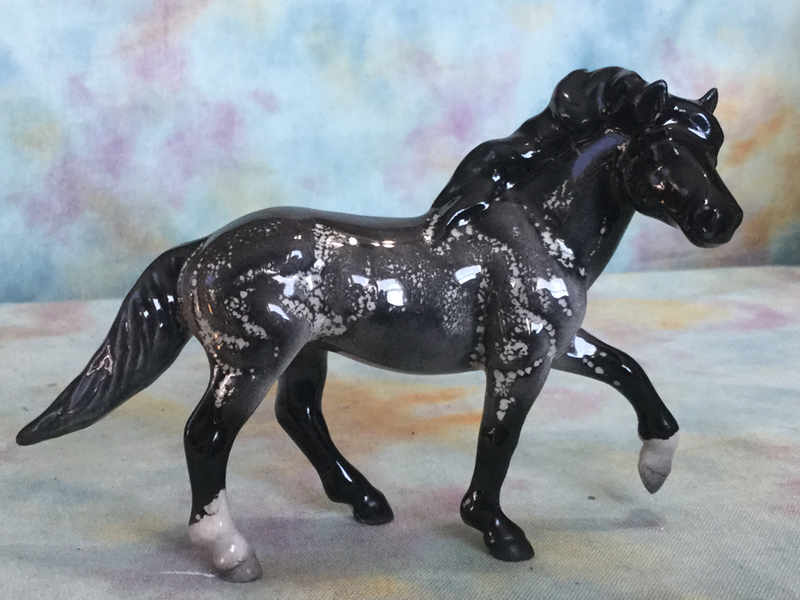 The horses shown below, if not marked "sold", will be posted on eBay at some point in the future, and a link will be added to this page for the week that they are listed. CMG Arabian mare to Araloosa- added color to her mane, tail, and pinking around her girth area. She also has added spots and hoof stripes. Sig. is on the bottom of the base, which she is permanently attached to now. CMG Arabian to Blue Zebra- We can't all focus on realistic stuff now can we. I think he makes a cute blue zebra. CMG Lippet- He was a weird matte yellow palomino with a very dark face. I made him a shaded glossy bay. I love how he turned out, and have plans to make the next horse even better.